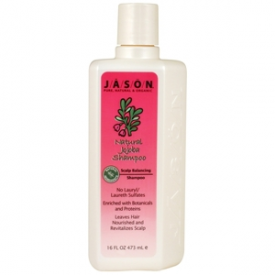 Jason Natural Jojoba Shampoo nourishes hair and soothes dry, itchy scalp. JASON Exclusive Planthenol-3™, 3 Proteins and Planthenol-3™ strengthen hair while pure, imported botanicals, vitamins and minerals give a moisturizing boost. This Shampoo removes sebum deposits that can cause dandruff, itching and hair loss. Jason exclusive Planthenol-3™ system is three plant-derived Panthenols (Vit. B5) that deeply penetrate the hair shaft and root delivering long lasting moisture, reducing the formation of split ends and increasing volume and manageability, leaving healthier, shinier hair. Use Jason Natural Jojoba Shampoo. Massage Jason Natural Jojoba Conditioner into hair and scalp. Aqua(purified water), lavandula angustifolia(lavender)hydroflorate, simmondsia chinensis(jojoba oil), calendula officinalis(marigold) extract, anthemus nobilis (chamomile) extract, cocamidopropyl betaine, yucca schidigera (yucca) extract, aloe barbadensis gel(aloe vera), cocamidopropyl hydroxysultaine, 22 keratin amino acids, triticum vulgare(hydrolyzed wheat protein), natural tocopherol(vit E.), ascorbic acid(vit.C), retinyl palmitate(vit A), glycerin(vege), decyl glucoside, oxybenzone, plantenol-3(plant phospholipids, DL-panthenol, ethyl panthenol, steardimonium panthenol), cyclopentasiloxane (and) dimethicone, citric acid, citrus grandis(grapefruit) seed extract, potassium sorbate, sodium benzoate, natural color, essential oil blend. Only a small amount of shampoo required and it really leaves the hair feeling clean. It has the most gorgeous scent and comes in a very easy to use bottle. I love that it is organic and not tested on animals.